How does or should you deal with a spouse that has mild bipolar or cyclothymia? One or twice a year there seem to be extreme highs that he can’t even talk his wife about without her thinking he is just against her or doesn’t care. Once it is declining she feels that she just bit off more than she can chew. He is really confused as to what he can do to help even out the highs and lows. He says they aren’t as bad as full blown bipolar but they are lifestyle affecting. 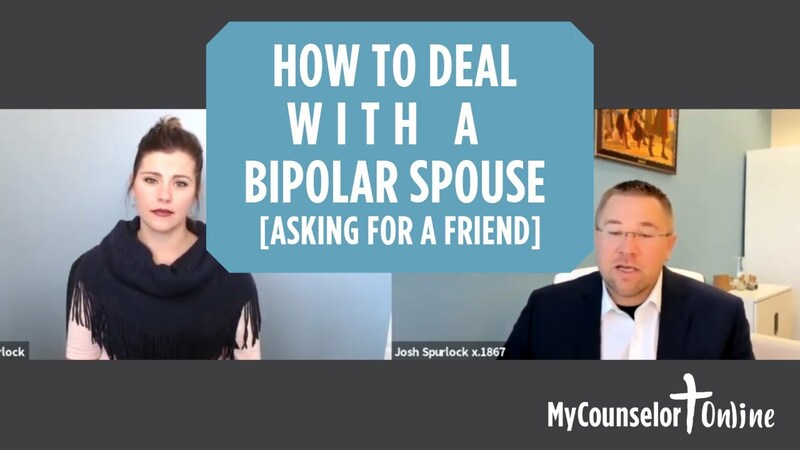 The post Asking For A Friend: How to Deal with a Bipolar Spouse… appeared first on MyCounselor.Online. My friend is 38 years old and was just told by her Mom that her Dad she has know all her life is not her biological father. Her Mom and Dad had IVF using a sperm donor, but never told her. Her Mom finally told her 2 weeks ago and now my friend is devastated, confused, disconnected, scared, worried, etc… She doesn’t know how to proceed in life right now. She has always been closest to her father, who she now learns is not her biological father. Hey, welcome to my counselor online. This is asking for a friend. I’m Cassie and asking for a friend is where you submit your questions and then I tracked down one of our awesome therapists and get them to answer your question, so today I have Josh Spurlock with me. And he’s going to answer our question that we have from an anonymous friend. So, Josh, thanks for hanging out with me today and answering this question. Well, it’s a tough situation that takes you by surprise, and definitely don’t see it coming, and yet is a a source of a lot of grief for everybody involved. Many made the decision not to share that information with their kiddos back in a day and age where that information would never come out. And today we have a DNA testing that’s becoming more and more common. They were not going to share the information with their kiddo that part of their genetic materials from other biology was not coming from them. And how to raise a child just like they would any of their other biological children or biological child. And so now they’re faced with the dilemma of this information coming forward in it creates grief for everybody. That mom and dad have oftentimes their self doubt involved in wondering, did we make the right decision we made the best decision that we could at the time we felt like that was the right thing to do. What I would encourage folks in the situation is really to have a whole lot of grace for everybody involved. Have grace for yourself as you’re going through this and maybe you’re experiencing the news for the first time and coming to reconcile that things that you thought were true. 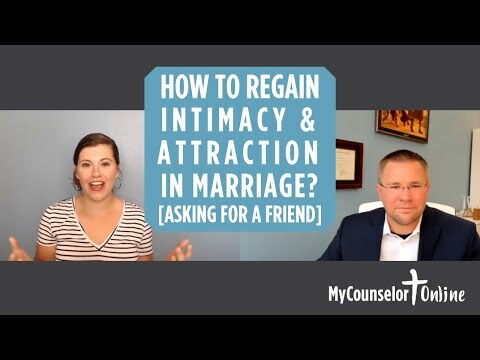 Are different than you thought them to be in trying to reconcile what that means for you what it means for the important relationships in your life. It’s really important that you give yourself space to grieve. That as mature individuals work through conflict, even if we disagree with the decision on how information was handled when or if it was disclose. We can be forgiving. We can have grace and we can work through those things so that we can still have a closeness and respect within our family, even if there’s a difference in our thoughts about how things should have been handled. Yeah. It’s really good. It’s a tough situation. Josh, thanks for meeting with me appreciate your time and Thank you, anonymous person for submitting this question. 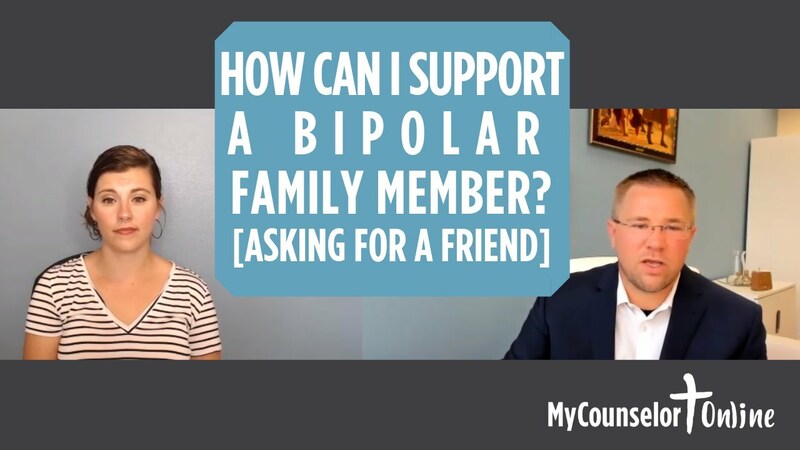 If you watching have questions, make sure to submit them to our Asking for a friend page on our website, my counselor online and then look for the answer in our weekly e newsletter and on the Asking for a friend page. 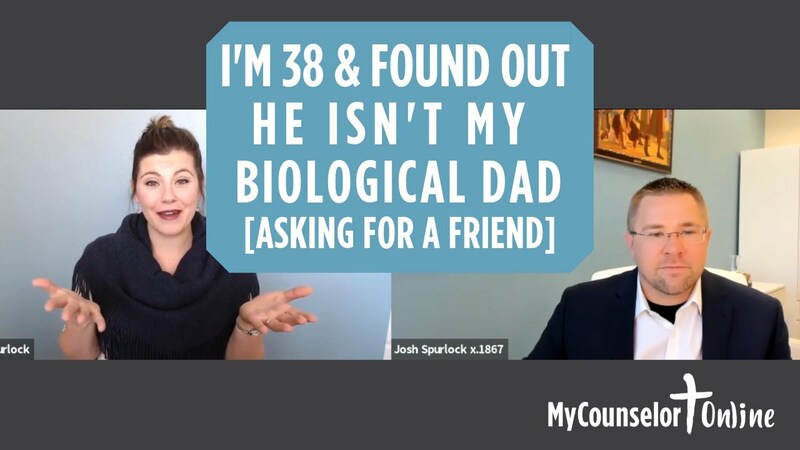 The post Asking For A Friend: Friend’s Dad is not her Biological Father appeared first on MyCounselor.Online. Is it possible to heal from depression without seeing a doctor or counselor? Asking for a friend is where you get to submit a question and I gets tracked down one of our therapists and get them to answer your question. Sure, absolutely. In fact, all of us on a regular basis and do so. Alright, so when we are talking about depression and we use the word depression. Usually what we mean clinically as we’re talking about what we call major depression which would separate out from other kinds of depression. So as you go through life we experienced times of depressed mood depressed brain chemistry and response to challenges that we’re facing alive. In response to biological things that are going on inside of our body that it’s just a normal occurrence that happens as a part of life. Where the circumstances results into press brain chemistry and we experienced the symptom ology of that can depression that where you are experiencing. Typically the we take care of ourselves. We get rest we connect with friends. We work through grief, we, we do the normal things that are part of navigating life’s challenges. In our body and our brain chemistry rebound into normal ranges and life kind of goes on. And so that’s a part of every human beings existence. So typically when we’re talking about depression from a clinical standpoint, what we mean is major depression and major depression Is when the brain chemistry get so depressed that we kind of get stuck in that place that instead of being able to rebound back up into its normal levels and allow our normal ability to process life As ourself. And with all of our emotional and mental faculties about us. We get kind of stuck in this depressed state. Now, sometimes we can get out of even a major depression a mild major depression without You know, using engaging in therapy or medication or any other kind of treatment of sort through homeopathic or self help approaches right and so Some of the methods that people commonly use and find benefit to results from our like self hope kinds of books that are going to talk through understanding the Mental components that can contribute to depression, the stinking thinking, as it were. In the process of understanding the mental in ways the cognitive ways in which you process life that are sabotaging you And addressing and changing those. Some people are able to kind of work out of depression five route of that and that’s great. At other times, employing just good bodily self care, you know, paying attention to diet engaging in good exercise feeding the body what it needs to be healthy engaging friends and family and having relational and emotional support that dressing life stressors things that are creating stress in your life identified solutions to those things and working to them so that your stress level decreases. These are all things that are homeopathic in nature that have a positive influence on brain chemistry and can help a person and I’ll depression, be able to Get out of them and be in a normal place of functioning. And so those are certainly routes that as a counselor. I always encourage clients to start with, right, they’re not necessarily easy sometimes going to the gym can be challenging. And that certainly as for me. And so it’s not that they’re easy but they don’t involve medication. They’re fairly inexpensive in nature. They don’t revolve Another one to What’s them. So that right kind of paying attention patterns and making sure that your body’s getting the sleep and rest needs. Right, right. And so engaging those things that you can do on your own first in seen if that doesn’t address the situation is a great place to start. For some, that’s not going to be enough to get them out of the depression that there and that they can do all the things that we just talked about. And they feel some improvement and the benefit from that. But it’s not enough to get their brain chemistry back into normal healthy ranges and so they’re going to need some help. The medication can jointly with counseling because medication can’t change the circumstances of your life that brought about depression. Not have this be a reoccurring theme in our life, or is it a biological predisposition, and we need to understand that and grieve that reality. That medication to treat that as may always be a part of our life which is never fun to hear and is never fun to be the case. You know, I Certainly empathize and understand folks that don’t want to be on a medication for treating depression. I don’t, I don’t want to worry i glasses. You know, I don’t like wearing sunglasses on. Don’t like contacts and I’m like mess with that. I wish I didn’t need them. But I’m thankful that they’re available because it allows me to see my clients, see my kids and my wife and allows me to engage life and a better way. And so I’m thankful that they’re available to me so that my biological issue with my site doesn’t have to deplete and take away from my life. And if you’re a person who’s biology would dictate that you are going to need a depressant medication in order to keep your brain chemistry in normal healthy ranges. I would encourage you to approach it like that that you wouldn’t see it as a personal fault or deficit.Just a reality of sins effect on our bodies and the brokenness of the world that we live in right now. And to be thankful that they’re available so that depression doesn’t have to rob you of the, the joyful life that God has created you for. So that’s how I would speak to that. As to your specific situation. Certainly there’s lots of more information that would be needed to be able to answer. What’s needed in your situation. But as a general answer. That’s pretty good direction. Well, thank you, Josh, for being with me and answering the question, and thanks for wearing those eyeglasses. And if you would like to submit a question like, Renee. You can do so using are asking for a friend page and we will, I will track down the therapist, get your question answered, and we will get that posted on our Asking for a friend page and also sent out in our weekly e newsletter. So check for it there. 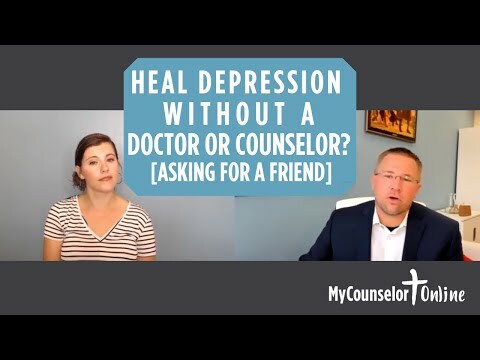 The post Asking For A Friend: Is it possible to heal from depression without… appeared first on MyCounselor.Online. 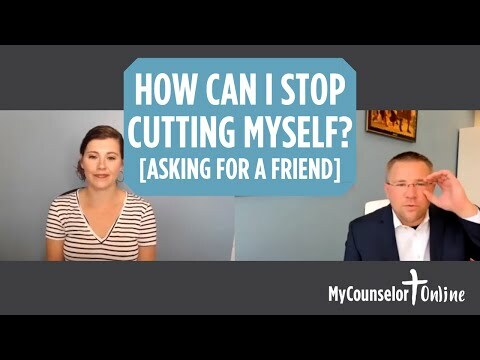 The post Asking For A Friend: How Can I Stop Cutting Myself? appeared first on MyCounselor.Online. 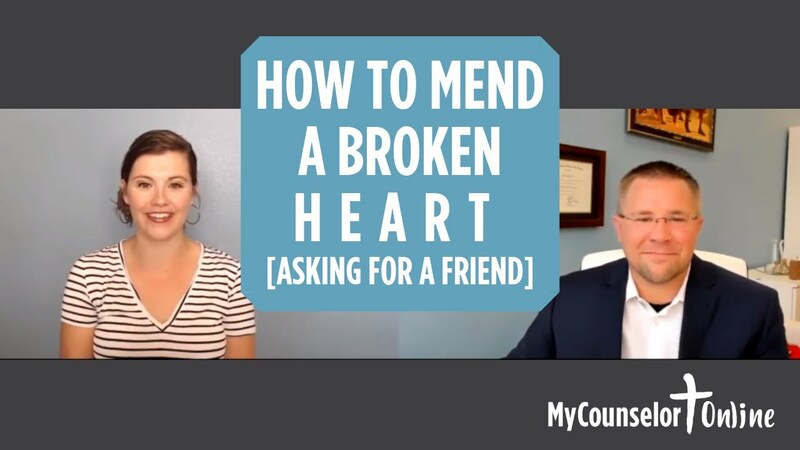 The post Asking For A Friend: Will a broken heart be mended again? 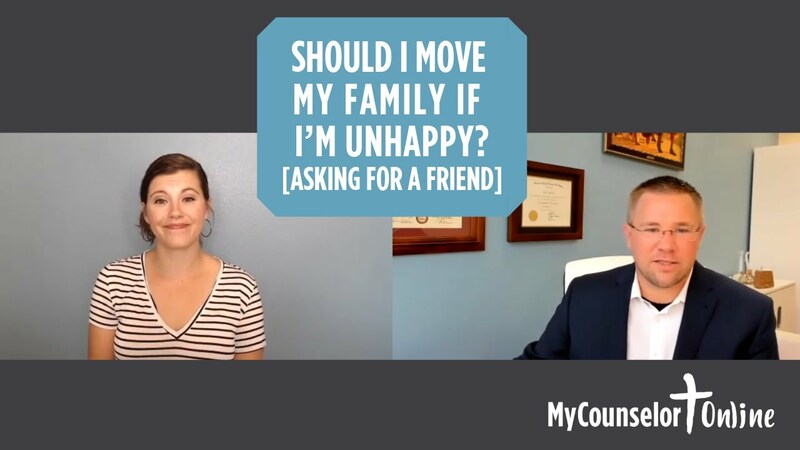 If yes, how… appeared first on MyCounselor.Online. The post Asking For A Friend: How Do You Maintain Intimacy When She is Not Physically Attracted to Him… appeared first on MyCounselor.Online. Nick has lost many friends in the past years due to them choosing to spend their time elsewhere. His small childhood church is also on a decline and few folks attend who are his age. He is stressed at his job despite the blessings it has been for his family. Nick wants to move from his childhood town and try something new, but he is not sure it is the right decision. He has a wife and two small children. Should he move them away from family for his happiness? Welcome to my counselor online. I’m Cassie and this is Asking for our friend, that’s where you submit your questions and I tracked down one of our awesome therapists and get them to answer your question, so today I have Josh with me. Josh, thanks for meeting with me. And our question comes from Nick. Well, I think it comes from somebody for Nick and Nick is lost many friends in the past due to them, choosing to spend their time elsewhere. His small childhood Church has been on the decline and new folks rarely attend who are his age. He’s stressing this job, despite the blessing and has been for his family. He wants to move away from his childhood town and try something new. But he’s not sure it’s the right decision he has a wife and two small children should you move them away from family for his happiness, Josh. What do you want to say to me. Well, I want to say thanks Nick for submitting your question or whomever cares about neck that’s submit this question on his behalf. And say, this is one of those tough situations in life where there’s not a clear answer. There’s not a definitive yes or no do this, don’t do this. Spread out on the table because this process has lots of moving parts, the situation as lots of moving parts. And if you don’t think through all the different pieces. Then you find yourself in a worse situation than you were before, right, which is part of the analysis paralysis that can sit in and causes just not make a decision at all. To save it a new destination isn’t necessarily going to change your situation that sometimes we think if I just get away from here and I get someplace else, things will be better in a different location. That maybe, maybe it wasn’t completely the environment that we were in. But instead, some stuff that’s going on inside of us. That is creating some of our situation and circumstances. And so we want to be careful not to put all of our hope and just changing our situation, our circumstances. Usually what I encourage folks to do is figure out how to be happy where you’re at. And from that standpoint, from that place of strength decided rather not. You want to go someplace else that because relocating moving someplace else may be the best option for you and for your family. But if you’re hanging your happiness or your hope for happiness on relocating to the different location. More times than not, people find themselves disappointed by that. A better route is figure out how do I find happiness, where it is that I’m ad and know how to cultivate that in my life. And from that place of strength. And it can be really detrimental to drag a family through a significant change like that in the pursuit of one’s happiness, especially if when you get wherever it is, you’re going, you’re not actually happy. I see that in my office at times. And there’s a lot of marital stress and distress that comes from that. And so you want to be careful not to go that route. Those thoughts are going to trigger fears and others, and maybe cause them to feel anxious and get stirred up by talking with a counselor. They don’t have a dog in the hunt. They don’t have any bias or interests, one way or the other. To be true that maybe just aren’t and to make sure that you don’t really damage the important relationships in your life trying to find a solution that may or may not be a real solution for you. Hopefully that was helpful to you. And if you have a question you can ask one of our awesome therapist by submitting your question to are asking for a friend page, then I will track them down. Have a an online meeting with them like this and we will post that up on her. Asking for a friend page as well as an upcoming edition of our weekly e newsletter. So you can look for it there. The post Asking For A Friend: Nick has lost many friends in the past years… appeared first on MyCounselor.Online.